Reach more people close to your church with both direct mail & social media invitations! It's called Outreach Everywhere and it provides your church with the most effective marketing: a combination of direct mail invitations with Facebook and Instagram ads - doubling your outreach impact! A form will be sent to you to confirm which Facebook/Instagram ad you would like. Once you select your social media ad to go with your mailing, we do the rest. We will run your ad directly from your church's Facebook Page. The ads will also run on Instagram - even if you don't have an account - all linking directly to your church's website. 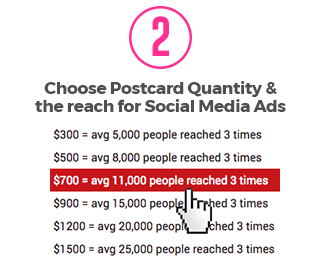 Just select a postcard and social media ad design to get started. 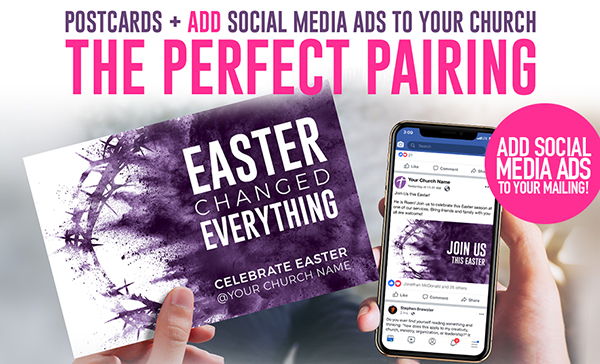 A professionally-designed social media ad that meets Facebook and Instagram standards to provide you with the most effective Easter invitations. A social media ad specialist who will place your ads for you so you can focus on preparing for Easter. A social media ad that is run directly from your church's Facebook Page - AND Instagram (even if your church does not have an Instagram account!) - linking directly to your church's website. People in your community will see your ads for 10 days leading up to Easter. Your social media ads will reach at least 5,000 people in your community and be seen by those same 5,000+ people at least 3 times! We will send you a report on how your ads performed! Why should my church do a mailing and social media invitations? Studies show that multiple touches (or impressions) of an ad or message provides higher response rates and brand recognition. By mailing a postcard and then targeting the same area with social media invitations - you will be able to reach your community multiple times on multiple channels. Your Outreach Everywhere social media invitation will reach at least 5,000 people multiple times! What is a targeted social media ad? 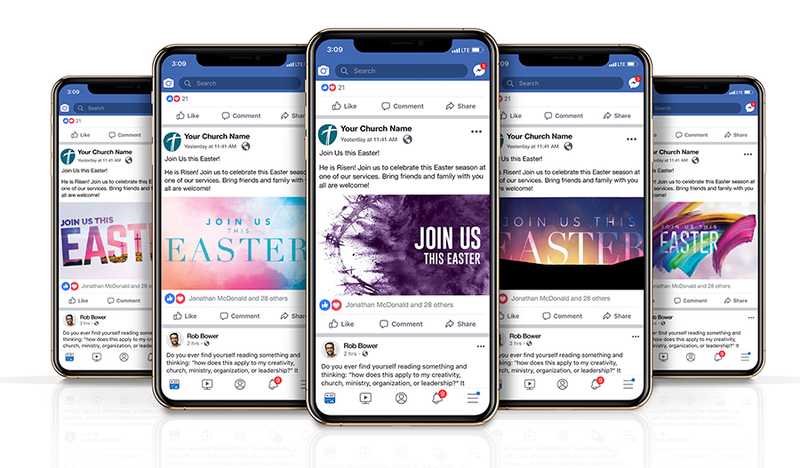 Unlike a regular post that you would share on your church's social media page, a social media ad promotes an event, business, or product, and is targeted as specific demographics or geographic areas. The Outreach Everywhere Social Media Ad Coordinators are experts in creating high-performing social media ads for churches. We will analyze your area and target either the surrounding zip codes or a specific mile radius around your church with social media ads, inviting your community to your Easter services. What will my social media ad look like? Note: The ads are specifically designed to be high-performing ads that follow mandatory guidelines by Facebook so the graphics are not customizable. 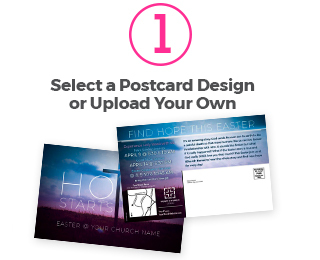 The copy above the graphic will have the church name and custom content about the Easter service or event from the postcard invitation. What is the process to get started with Outreach Everywhere? Place your mailing order and select the Outreach Everywhere option. An Outreach Specialist will walk you through what to expect and next steps for your mailing and social media ads. Check your email! An Outreach Everywhere email will be sent to you with a form to select your social media ad design and needed information to setup your ads. This form has to be completed to run your Outreach Everywhere ads. Once your form is complete, a Social Media Ad Coordinator will reach out to you to complete the final steps to get access to your church's Facebook Page to be able to run ads for you. The Social Media Ad Coordinator will also send you some tips, resources and best practices to have your website and social media pages visitor-ready. 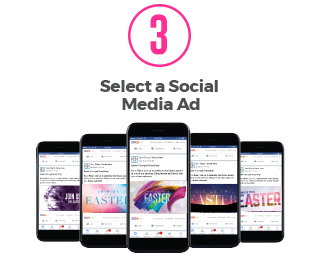 After your Easter services are over and ads are complete, your Social Media Ad Coordinator will send you a report on how many people saw your ad, clicked on your ad, and went to your website! What if my church is doing a large mailing (over 5,000 postcards)? There are larger options of Outreach Everywhere too! How much of a benefit is it to combine social media ads with my direct mail? Studies show that multiple “touches” (or impressions) of an ad or message provides higher response rates and brand recognition. The average person spends over 130 minutes on social media per day and is the source of the most minute by minutes interactions between people. Your church needs to be where the people are and where conversations are taking place to invite and share the Gospel. By mailing a postcard and targeting the same area with social media invitations, you will be able to reach your community multiple times on multiple channels. Your Outreach Everywhere social media invitation will reach at least 5,000 people multiple times! Can I get a custom social media ad made that matches my custom postcard? Yes an Outreach designer can create a full custom social media ad to match your custom postcard - the design fee for the social media ad is $95. Ask your Outreach Specialist to help you place this order. Will every person who gets my postcard also get a social media ad from my church? The social media ads for your church will display on Facebook and Instagram for 10 days prior to your event and will be seen in approximately the same geographic area as your postcard. Keep in mind that only people who use Facebook and Instagram will see your ads. What should I do if we don't yet have a Facebook page? You will need one in order to run ads. You can create one in a few minutes with these steps. What if we do not have an Instagram account? You do not need to have an Instagram account for your church to have social media ads appear on that site. Your ads will link directly to your church’s homepage. When will my ads run on Facebook and Instagram, and for how long? The social media ads for your church will display on Facebook and Instagram for 10 days prior to your event. How many people on Facebook and Instagram will see my ads? Your Outreach Everywhere social media invitation will reach at least 5,000 people multiple times - depending on which social media sites they visit the most. How will I know if visitors are coming because of the postcard or the social media ad? While not every visitor wants to be acknowledged as being new to your church, you could ask visitors who do fill out a community card or pick up a visitor gift how they heard about your church. After your event, your social media ad coordinator will send you a report on how many people saw your ad, clicked on it and went to your website. Can I customize my social media ads? The social media ads that we have created are designed to meet Facebook's requirements (less than 20% text) and to provide maximum performance for your church. You can choose to have an Outreach designer create a full custom social ad for you for a small design fee. What is difference between a motion ad and a static ad? Motion ads feature a short animation that may draw more attention to your ad online. Because these types of ads are considered “videos” by Facebook, a motion ad may have more exposure on that site. Why are there fewer motion ad choices? During the launch of Outreach Everywhere, we have chosen to create motion ads for designs that best lend themselves to that type of graphic. As we expand the design selection we will add more motions. Can I choose more than one ad? No- it’s best to be consistent with an ad that is only running for 10 days so that viewers can see it multiple times and remember what they have seen. Why isn't there a social media ad that matches the postcard design I've chosen? We have created social media ads for our most popular Easter postcards plus we have made ads that were designed to work with any Easter postcard. If you have chosen a postcard design that does not have a coordinated social media ad, you can have us create an ad for that design for a $59 design fee. Ask your Outreach Specialist to help you place this order. If I upload my own postcard designs, can you make me a social media ad to match? No; not all postcard designs work well as social media ads nor will they adhere to the stringent requirements for Facebook ads. It’s best to choose one of our social media ad designs that have been tested and proven to work well online. Can I have a copy of the social media ad so I can post it to my website or share it on my personal social media pages? Not at this time - though we may offer this option in the future. What is the best way to follow up with people who comment or like my social media ads? Responding to people who comment on your ads is an important way to start a conversation and create online engagement. In addition, it will help your ads continue to be successful through Facebook. Try to have someone on your staff respond and answer comments and questions as quickly as possible. Also ask people who respond to your ads to LIKE your church’s page, this will increase your reach. Our church is supplying our own art for our postcard. Can we provide a custom Facebook ad that will match our design? Yes you can design your own social media ad that matches your postcard however the design needs to meet Facebook standards including only having 20% text. We will provide you with a link to test your ad prior to sending us the design. Ask your Outreach Specialist to help you place this order.